The springy keel is formed from a medium-stiff piece of mono with a number of beads strung along the mono. The beads can be heavy or light, small or large, brass or glass according to the requirements of the fly size and pattern. Because of the leverage of the keel, not much weight is needed to keep the fly riding with the hook up. Many hooks are suitable; a commonly used hook is a 2xlong nymph hook with turned down eye (it will be turned up in the finished fly). The photo strip at the top of the page shows some possible Bouncer patterns (Clouser-like, bugger, minnow, crawdad, beetle) on hook sizes 2 - 12. The photo sequence below illustrates the basic technique with the construction of a zonker Bouncer. The tail and eyes were added first. Then the mono keel is lashed to the shaft --with extra lashes at the bend of the hook, and with two inches of the free end of the mono extending to the rear. Then the rest of the fly is built, and finally the mono is loaded with the beads and the end bent around to be tied in at the head of the fly. Important: Crimping the end of the mono, or melting a ball on the end, before tying in will keep the mono more secure at the head tie-in. A cheap butane lighter works well to ball the end. The most common method for making the keel is to tie in the mono with the free end pointing backward, as shown above, with the end of the beaded loop being tied in just before the fly is whip-finished at the eye. However it is advantageous in some patterns to tie the mono in with the free end projecting over the hook eye; in this case the beaded keel loop is completed near the bend of the hook, with the final tie-off usually being also near the bend as shown in the following tying sequence of a simple BuggerBouncer. It is a bit easier to make a sleek loop this way, and the head of the fly is smaller and neater; in addition, the beads can be positioned a bit more forward, and the critical tie-in of the loop is less subject to abrasion on the bottom. We are partial to Amnesia mono because of its color, but any mono will do. We use 30-40-lb mono on larger flies, and 15-lb on flies sized 6-10. The beads may be varied to adjust the weight distribution; for example, for crawdad patterns, we use two brass beads under the head and lighter glass beads under the tail. This ability to tune the weighting can improve the action and reduce the chance that the fly will fall head down into a crack between two rocks, as sometimes happens with other weighted flies. There is no need to use costly, machined beads for a Bouncer: inexpensive brass and glass beads from a craft store work fine. Black non-magnetic hematite beads will not corrode in salt water, come in various shapes and sizes and cost 2-3 cents each at a craft store. The zonker-style Bouncer was made with hollow brass beads used to make spinners. Important: unless a lot of weight is needed, it is better to use fewer beads or smaller beads, because fewer beads click better and the fly casts more easily. 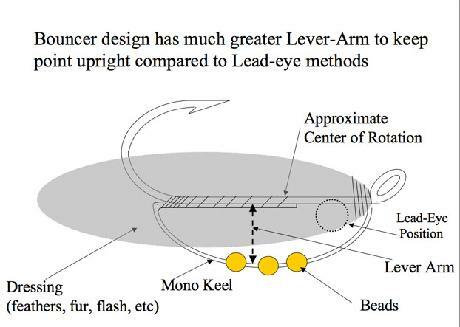 As a side benefit, a lightweight Bouncer keel does less damage to a rod than lead eyes will if the fly should hit the rod during casting. (Note: a 3-mm bead weighs about 1 grain, whereas most solid metal eyes weigh 5-10 grains; for comparison, the first 30 feet of a 7-wt line weighs about 190 grains). An assortment of gold-plated beads especially selected for Bouncer flies is available from the All Season company www.allseason.com . These beads (about 900 at about 2.5 cents each) will tie Bouncers from size 12 to larger than 3/0. Stringing the beads can be a little tedious; loading the beads beforehand on large safety pins is good for bead storage and can speed up the process of slipping them on the mono at the tying vise. In some cases, the beads can be loaded on the mono beforehand, and kept in place with a knot, as shown in the buggerBouncer above; a number of loaded keels may be made in a long string and cut apart as needed. The rearmost bead can often be replaced by a short section of PonyBeadLacing (PBL, described in more detail later) ; this material is soft vinyl tubing, 2 mm in diameter, that is easy to handle, and protects the end of the mono keel from being chafed by raw edges on the beads. This material is often used to position the weights somewhat more forward. Look for it at JoAnns or online. On the keel, you may want to try faceted beads, plastic pearls, glow-in-the-dark beads, even sequins to push a little more water.